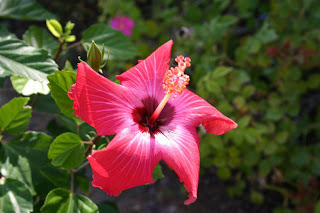 'Painted Lady' is an unpatented Hibiscus cultivar with single flower form, pink flower color, and a dark red eye. Apparently, the original name was Indian Princess. Reported to have Hibiscus storckii as a parent. I am interested in finding out more about the heritage of this striking variety. This photo was taken early one morning, before the flower had completely unfurled.